This all new, advanced-level guide to Adobe Photoshop 5.0 is written specifically with the photographer in mind. Author Martin Evening, covers all the basics of image capture and manipulation, color balance and retouching. proofing and final printing. Includes a CD-ROM tutorial with shareware images for practice. For both Mac and PC computers. Adobe Photoshop 5.0 for Photographers bridges the differences and illustrates the connections between traditional, hands-on, chemically intensive photographic processing and manipulation and its computer-based alternative. 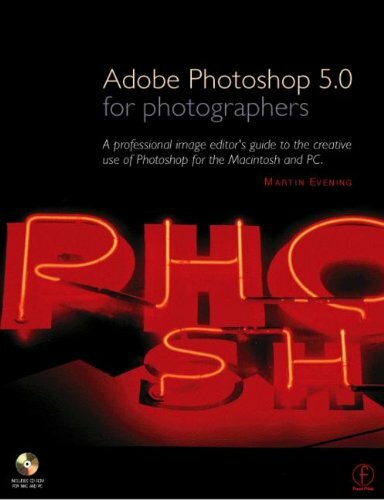 With its graphically rich examples and detailed diagrams of Photoshop 5.0's user interface, this book will easily transition users with an eye for images into the digital methodology. Adobe Photoshop 5.0 for Photographers makes no assumptions about the reader's level of proficiency with the popular software. Instead, it begins with an examination of the many means of acquiring images (the fuel for Photoshop) through digital cameras, scanners, and from CD-ROM collections for your PC. Once you've set up the necessary hardware, the book walks you through Photoshop's tools in thematically arranged sections like "montage" and "image repair and retouching." Traditional photographic savvy is well-placed throughout the book, particularly during the discussion of color-toning images (like those in sepia-toned photos) in which this book contrasts the chemical bleaching and dying method of old with Photoshop's Duotone tool.